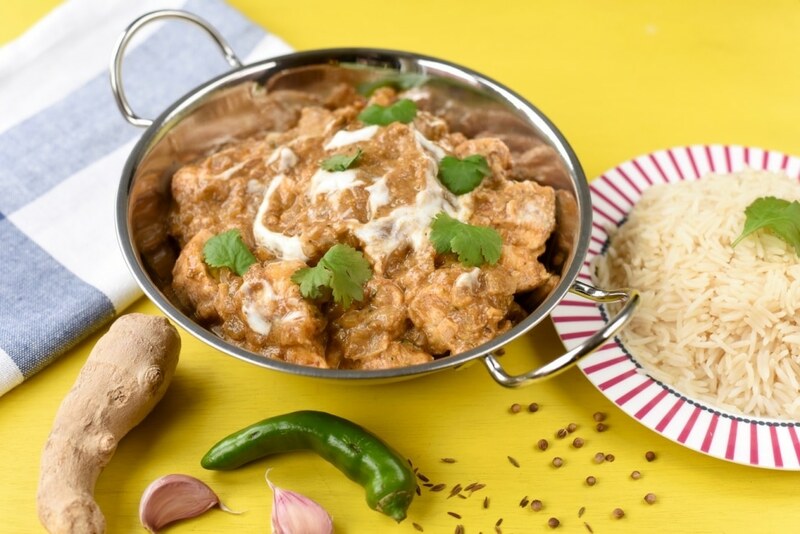 Not all curries have to be spicy and if you are looking for something with all of the flavour of a curry, but none of the spice, then a Chicken Korma is for you. An added bonus is that it is much lower in calories and fat than most curries. 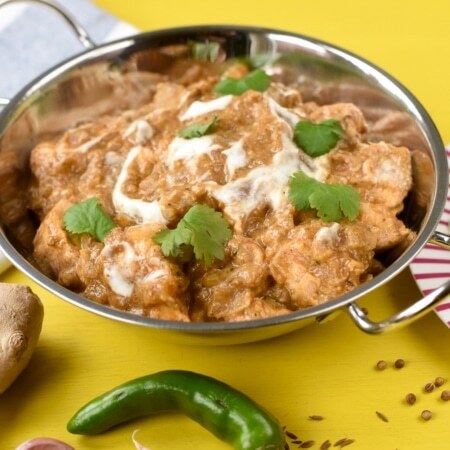 I know there are people out there who don’t like spicy food (as alien as that seems to us, we absolutely love spicy food), so they tend to avoid Indian food. Well, Indian food does not have to be super spicy. The spices can be used to just add flavour and you can either use just a little chilli, or leave it out completely. Remember that recipes don’t have to be followed exactly, and you can adapt things to suit your own tastes. For the British people reading this, you will notice that this recipe does not have coconut in it. Traditional South Indian Korma does not actually have coconut in it, and this was something that was added in British curry houses. You can add coconut if you want, but this recipe definitely doesn’t miss it. 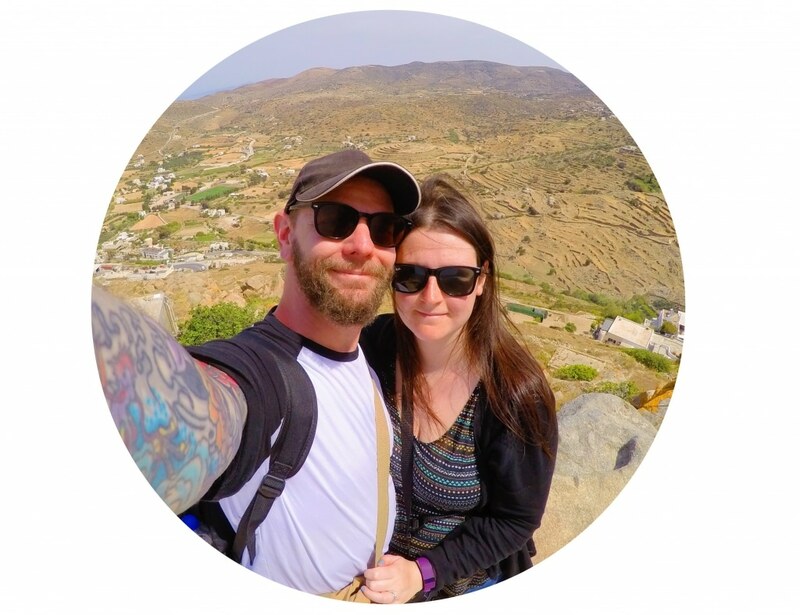 We would happily live off curry and going to India and experiencing it all first hand is a bit of a dream for us. A couple of year ago, Dannii gave me an Indian themed hamper for Christmas. It had a few Indian cookbooks, an awesome heavy frying pan and loads of spices in it. 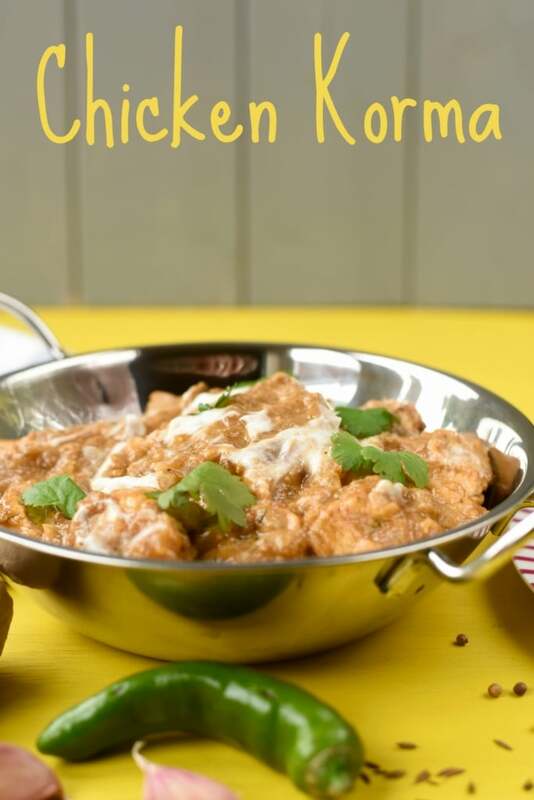 Every since then I have been experimenting with making healthier versions of traditional curries and this is one of our favourites. I made a healthier madras last night too and will be sharing the recipe soon. It’s so easy to spend a lot of money on takeaways and they are usually dripping with oil. 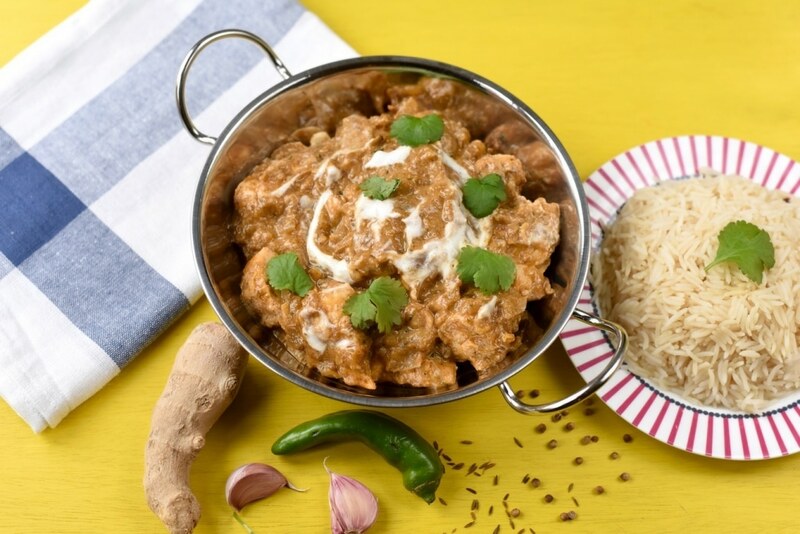 Whilst curries might look difficult to make, when looking at the ingredients list, that is just the spice mix to make the paste and you can always make extra paste and keep it in the fridge for an even quicker curry. I know it might seem easier to just buy the paste, but those jars cost a couple of pounds and I bet you have most of the spices in your spice rack to make the paste anyway, making it free! So save yourselves some money and calories and give it a go yourself. I love making curry pastes and they are really simple, yet alway come out so fragran and so much nicer than the store bought ones. 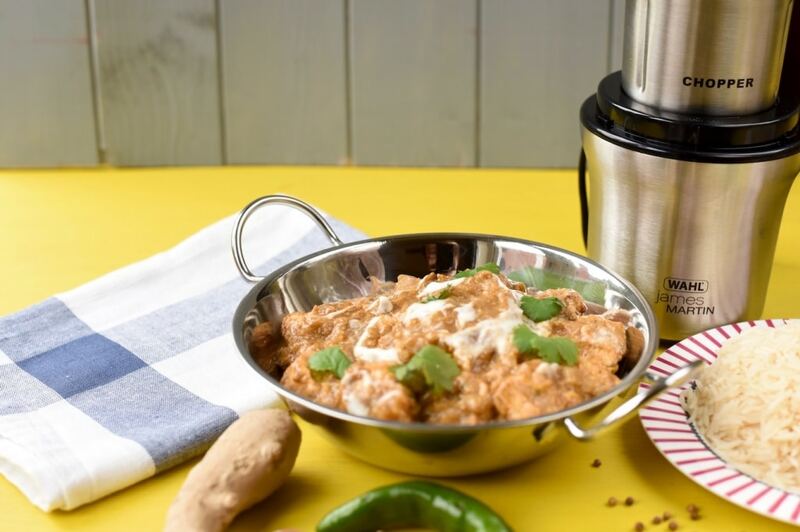 What makes making curry pastes so much easier is having the right kitchen equipment – we have been testing out the James Martin Grind and Chop and it makes making curry pastes so much easier. It is compact yet powerful and is perfect for grinding and chopping wet or dry ingredients. 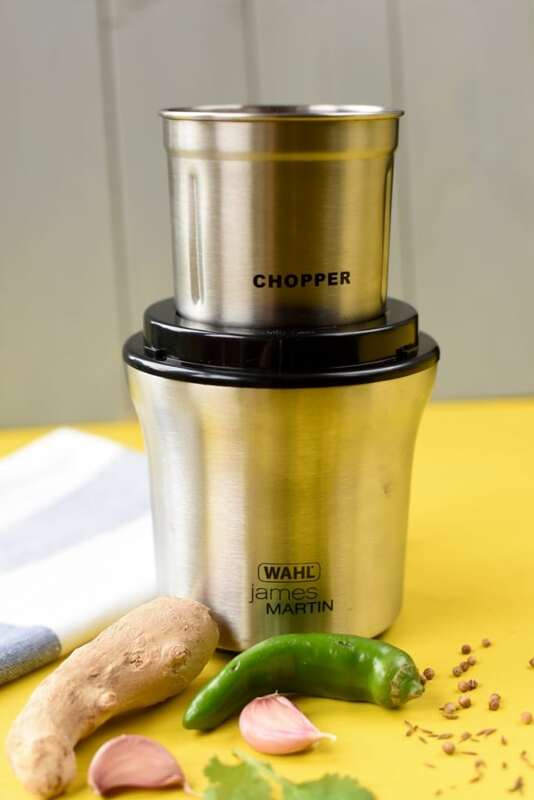 It’s really simple to operate and can be used to grind or chop a huge variety of things: from garlic, ginger and vegetables to dry spices and coffee beans. It’s not just for curry pastes though, we have make nut flours in it, salsas and all kinds of sauces and marinades. Not only is it stylish and versatile, but it’s really easy to clean as well, which is so important to us when it comes to kitchen gadgets. It is disheashe safe too though. The powerful 200W motor means that we haven’t come across anything that it can’t do yet. I am not sure how it would cope with making nut butters, but we are going to try that next. I always used to use a pestle and mortar to make my curry pastes, and that worked fine, but the Grind and Chop really takes the hassle out of it. Although we have only had it a week, it’s an excellent quality product and I think it will stand the test of time. We really put our kitchen equipment to work, as we use it so often and I don’t think this is going to let us down. If you are short on kitchen space, this is ideal as it is small, by mighty! 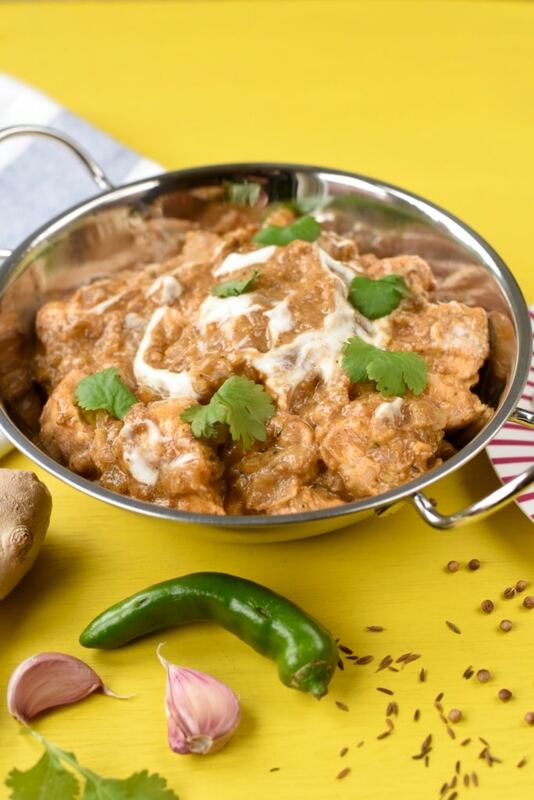 This Chicken Korma also goes really well with a Peshwari naan and we serve ours with some rice too. It’s Chinese New Year coming up, so expect to see some more healthier takeaway options. This year we are all about saving you money and calories! 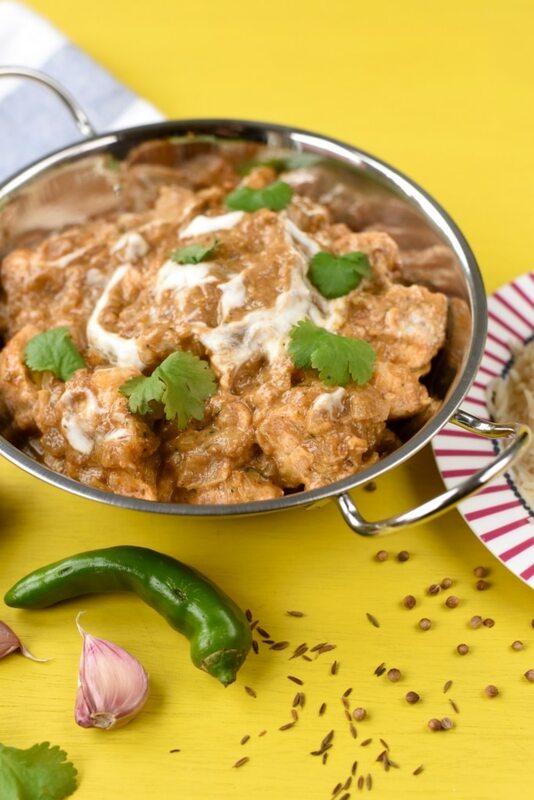 Not all curries have to be spicy and if you are looking for something with all of the flavour of a curry, but none of the spice, then a Chicken Korma is for you. Heat a dry frying pan and toast the spices until fragrant. Don't heat for too long or they will burn. Remove from the heat and leave to cool. Put the garlic, ginger, salt, 2 tbsp oil, tomato puree, chilli (if using), almonds and coriander into your Grind and Chop and blend into a paste. Heat the remaining oil in a frying pan over a medium heat and fry the onions and chicken until browned. Add the korma paste and stir until all the chicken is coated. Add the water and simmer until the chicken is cooked. Remove from the heat and stir in the Greek yoghurt. I love chicken korma but I have never tried to make it from scratch. I am going to try this recipe. This recipe sounds and looks so tasty. Would love to try this.